The rain was verging on torrential yesterday in the Westcountry and I was watching telly last night in slippers and a big woolly jumper, wondering if it is too soon to turn the heating back on. So it seems slightly ironic that I’m now sat here writing a round-up of summer spice dishes. The scorching heat of July seems another world now, but hopefully the thought of these deliciously vibrant recipes will brighten the mood just long enough for the sun to make a reappearance. We start with these tasty Pudina Paneer Tikki or Mint and Indian Cottage Cheese Patties (1) from Linsy at Home Cook Food. Made with mashed potato, grated carrot and paneer and flavoured with lots of mint, lime, chilli and ginger, these would be delicious served with your favourite chutney – or perhaps some of this mouthwatering Usirikaya Pachadi / Goose Berry Pickle (2) from Shailaja over at Sahasra Recipes. 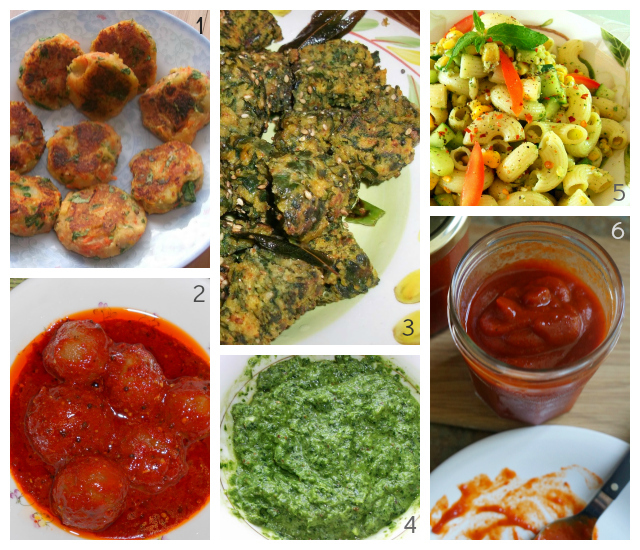 Linsy at Home Cook Food has also entered her Kale Spinach Muthia (3), a wonderfully healthy snack, and her Chimichurri Sauce (4), a gorgeous Argentinian salsa perfect with steak, chicken or even pasta. Pridhi from Drizzling Delicacies is up next with her Summer Coolant Pasta Salad (5), simply bursting with fragrant flavours, like lemon and mint, and I love the addition of the crushed peanuts. Chilli sauces are very popular at Chez Bangers but for some reason I’ve never had a go at making my own. That’s going to change now I’ve seen this fabulous recipe for a Chipotle Chilli Sauce (6) from Laura at How to Cook Good Food. I adore the smokiness of chipotle chillies and I know this would be the perfect accompaniment to my scrambled eggs in the morning. Super tasty and just as healthy, this Turkish-inspired Fasulye with Dukkah Roasted Tofu (7) from Choclette at Chocolate Log Blog looks so tempting, and I am intrigued by the idea of chocolate dukkah. But of course chocolate had to feature in there somewhere! These spicy Courgette Pakoras (8) from Jill at Lapin d’Or and More are a great garnish for a big bowlful of summer courgette soup. And I love the fact the recipe comes from a cook book from an old Newcastle cafe that my Mum used to take me to when I was a kid, The Red Herring. I’ll have to make these for Mum next time she comes to stay so we can reminisce together. My family really go for ‘parcel’ food; tasty fillings wrapped in pastry. So I’ve got to try these Briouates Stuffed with Spinach & Meat (9) on them. They are from Cheryl at Madhouse Family Reviews and are like a Moroccan take on a samosa. The meat and spinach are delicately flavoured with cumin, paprika and cinnamon; and you can also create sweet versions filled with lovely things like almonds and honey. Cheryl from Madhouse Family Reviews has another couple of dishes to share. 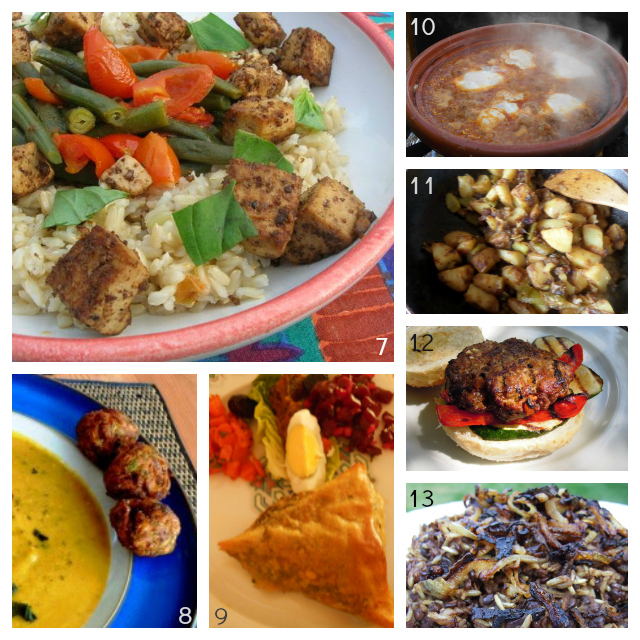 Her Moroccan Kefta Meatball Tagine (10) is a satisfyingly flavoursome meatball stew served with eggs on top (I love any thing with an egg on top! ), while her Patatas a lo pobre (11) or poor man’s potatoes is a quick and easy Spanish dish, perfect to go with just about any meat or fish dish. My turn next with these Bobotie Spiced Beef Burgers (12), which I created with after coming across a recipe for the South African bobotie dish in a cookbook and translated into burger form. Fried onions has to be one of the most fantastic smells in all the world, and I bet this Mejadra (13), a Middle Eastern dish of rice and lentils topped with lots of beautifully caramelised and crispy onions, from Helen at Family-Friends-Food smells incredible and tastes even better. Time to bring out the puddings now I think. How about a slice of this beautiful Ginger Zinger Cake (14) from Linzi at Lancashire Food? This light and moist cake is packed with flavour, featuring ginger in four different forms, and Linzi promises you’d never know it was gluten-free. Or how about a generous helping of this Apple & Pineapple Eve’s Pudding (15) from Helen at Casa Costello. I often make my Nana’s recipe for Eve’s Pudding, but do rather like the sound of adding pineapple too. A proper old fashioned pud – yum! This Peach Streusel Kuchen Traybake (16) from Sarah at Tales From the Kitchen Shed is a lovely German-style yeast cake with a lovely nutty cinnamon streusel topping and filled with juicy ripe peaches. Doesn’t it look and sound heavenly? And finally Helen from Family-Friends-Food has made us this pretty Lemon, Lavender & Almond Cake (17), which is another gluten-free cake, this time featuring potato flour, which I must admit I’ve never used. While, technically, lavender isn’t exactly a spice, it looked so wonderful I had to overlook that as it such a light and fragrant cake, absolutely perfect for a summer tea party. This month’s winner receives a fantastic gift set of summer Spice Drops from Holy Lama, which are a brilliant and easy way to quickly add an intense spice hit to your dishes without the need for roasting or grinding. I’ve been playing with some Spice Drops in recent weeks and particularly like the fennel seed extract, which I used in a marinade for lamb chops. It tasted amazing. “Our first runner-up prize goes to Cheryl at Madhouse Family Reviews for her Briouates Stuffed with Spinach & Meat. Spinach takes spices flavours very well and adds moisture to the dish. I like the finger food possibilities in this recipe and the combination of crunch and creaminess. 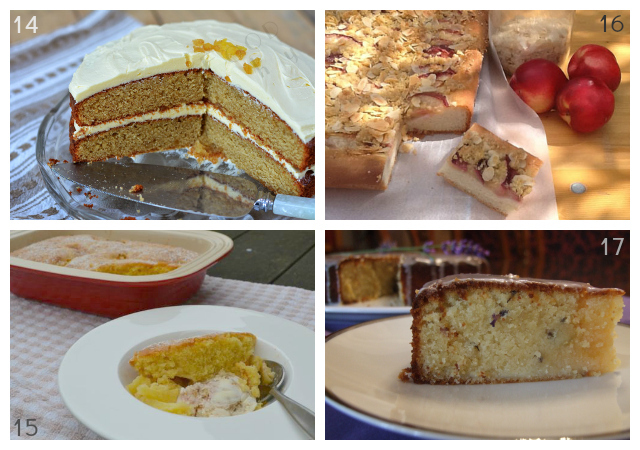 “The second runner-up prize is awarded to Helen from Family-Friends-Food for her Lemon, Lavender & Almond Cake. I was impressed by the addition of potato flour to keep the cake moist. Flowers make wonderful flavourings for sweet and savoury dishes. Congratulations to all three of you and thank you to everyone for taking part in July’s Spice Trail challenge. And of course a big thank you to Gouri at Holy Lama for kindly judging the entries and providing such lovely prizes. August’s Spice Trail is now open and the theme this month is Beach Barbecue. Yes, I’m ever the optimist, but as I get to the end of this post I find myself having to move my laptop to the other side of the dining room table as the morning sun streams through the window, so it seems my optimism isn’t always misplaced! great theme, background – Excellent Topic! Nice round up of dishes Vanesther. Thanks Jac, we got some lovely entries this month. Thanks Karen – hope you had fun! What a fab round up & the recipes look so delicious, just have to try the dukkah roasted tofu. Thanks Sarah. I do so love the sound of that tofu and chocolate dukkah, and your peach streusel kuchen looks wonderful too. Fabulous round-up as always. The hard thing is knowing where to start! Thank you so much Vanesther and Gouri too for picking my dukkah as a winner. This has made a great start to my weekend. And a thoroughly deserved win too, Choclette. I really look forward to trying your chocolate dukkah – sounds amazing! Email me your address and we’ll get your Spice Drops out in the post to you.